Orcland Raiders Unboxing – WAAAAGH! About a week ago, I got a box from Forge World with the Goblin Secret Weapons inside. I wrote about those minis a few days ago, and intended to write about what else was in the box a day or two later, but things just did not work out that way. Life happens, I suppose. 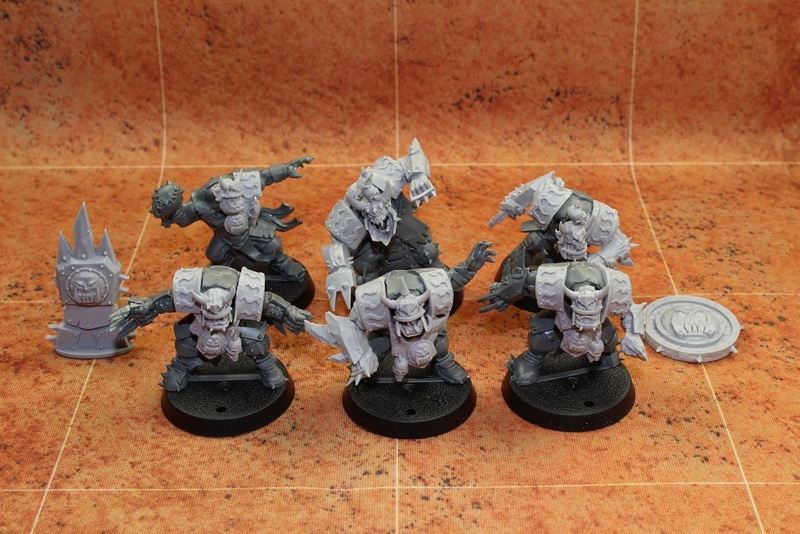 Well, last night I finally managed to sit down with the second item, and I was able to assemble some Orcs! WAAAAGH! Now, if I have not mentioned it before, Orcs were my very first Blood Bowl team somewhere back around 1997-ish. I know they are a lot of people’s first team since they come in the boxed set, but there was just something that I loved about the team. When my friends showed up with the game and Death Zone expansion, the first thing I did was run out and buy the erd edition Orcland Raiders box from my FLGS. These minis were also the first real minis that I ever painted. I mean, I had dabbled in painting minis in my mid-teens, but I had NO IDEA what I was doing at the time. I did not actually know anyone, at the time, who was into miniature games, so I did not even know that I was supposed to prime the minis first. I just took the Testors enamel paints I had used for model cars, along with some of my step-mother’s Walmart acrylic paints, and I slapped it straight on to the bare metal minis using the free plastic bristled brush that came in the Testors box. 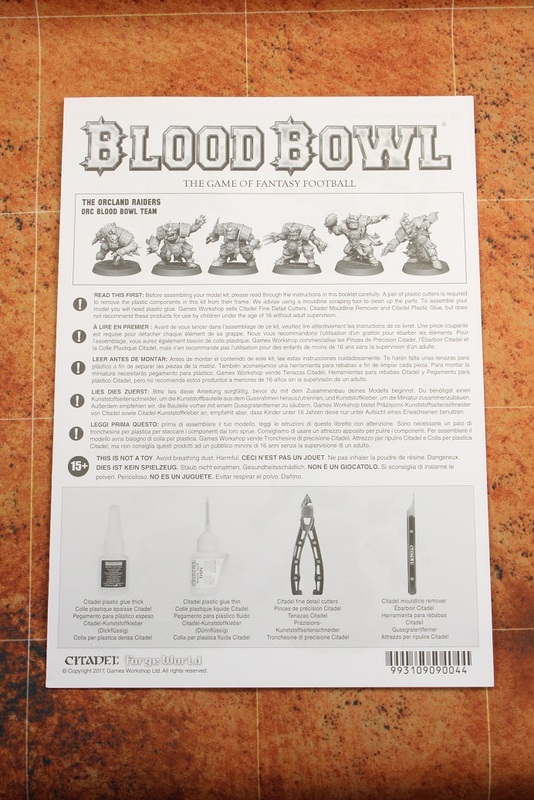 It was not until several years later, when some of my friends walked in with Blood Bowl and Necromunda boxes under their arms, as well as a handful of Citadel paints in their hands, that I learned even the most basic of painting techniques. It was with my beloved Orcland Raiders that I learned about washes for shading, and dry brushing for highlights. It was a fun time, and years before my realization that I hate painting minis. I still have that 3rd edition Orcland Raiders team, and while the paint job might not hold up all that well, they are still one of my favorite teams. 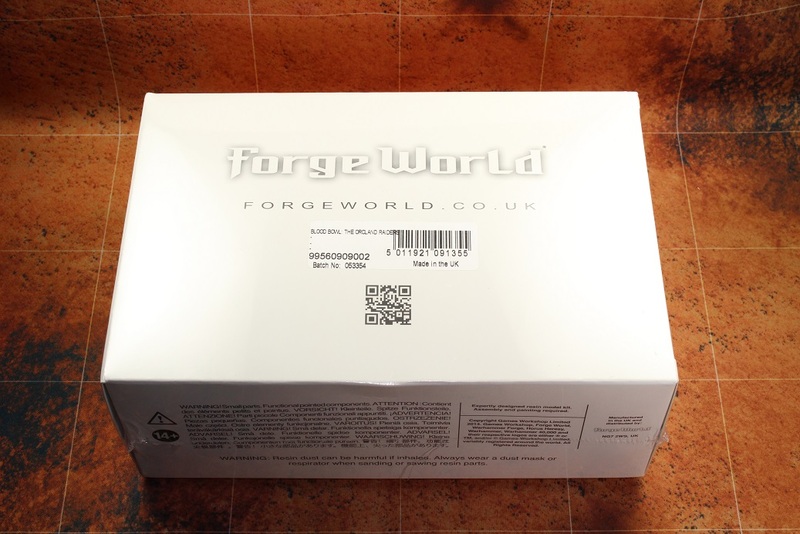 The team comes in the standard, non-descript white Forge World box. It would be a little cooler if they came with nice box art like the standard Games Workshop teams, but I understand why they do not. 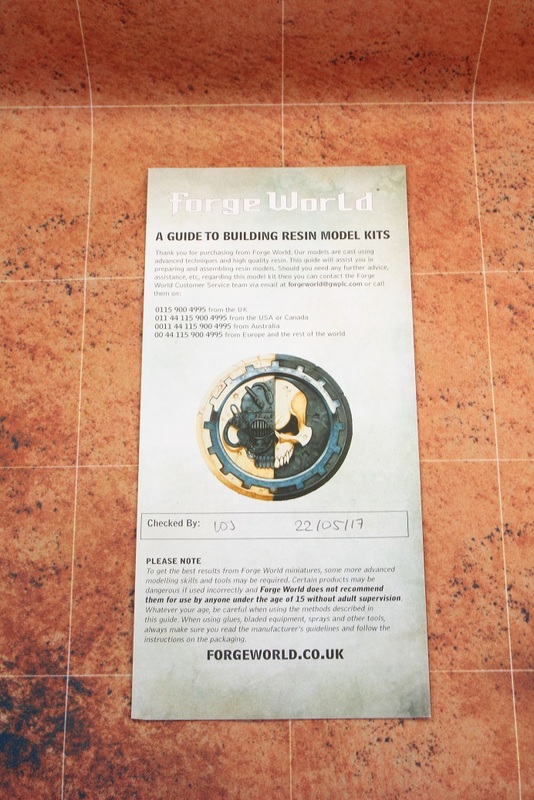 Like other Forge World boxes, you get the standard Guide to Building Resin Model Kits pamphlet. You also get the four-page assembly insert. The first page has information about necessary tools and whatnot. Opening the insert shows you the assembly instructions for the minis. 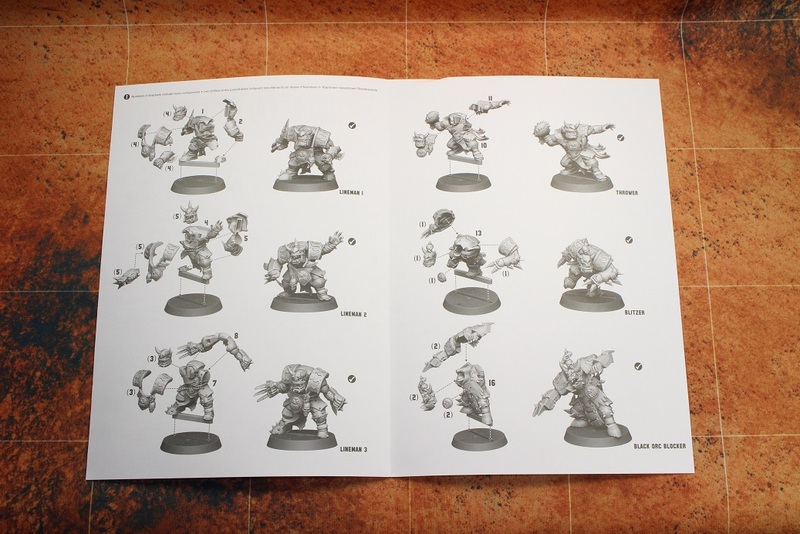 Like the standard Orc team, the new Orcland Raiders come with two copies of six individual sculpts. 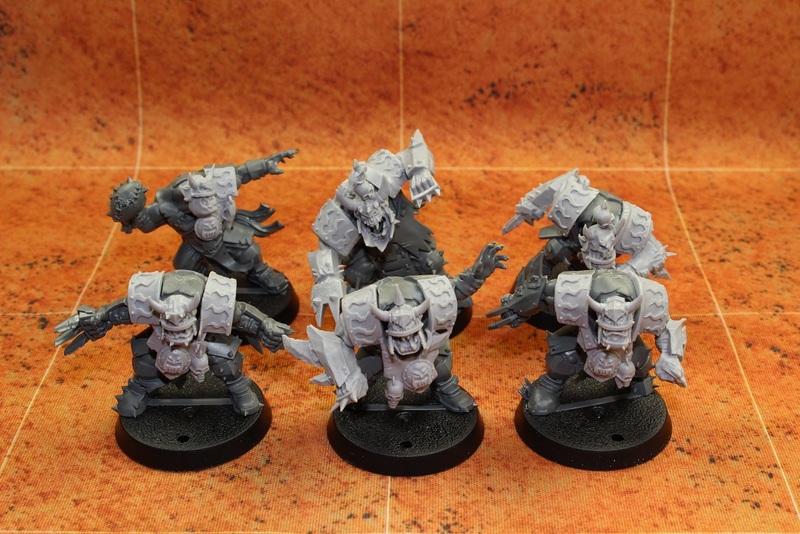 Three different linemen, and one each of the Black Orcs, Blitzers, and Throwers. As others have said before, I would have been happier with more repeated Lineman sculpts and fewer repeated positional sculpts, but I digress. The last page of the insert has roster building information. Note that the Orcland Raider roster building information is exactly the same as the previously released Orc team roster information. 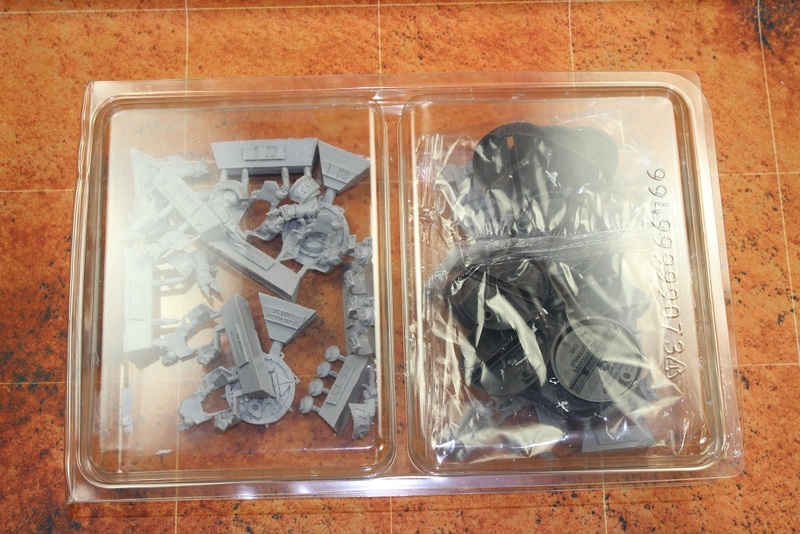 Inside the box, you get two Orc player sprues. 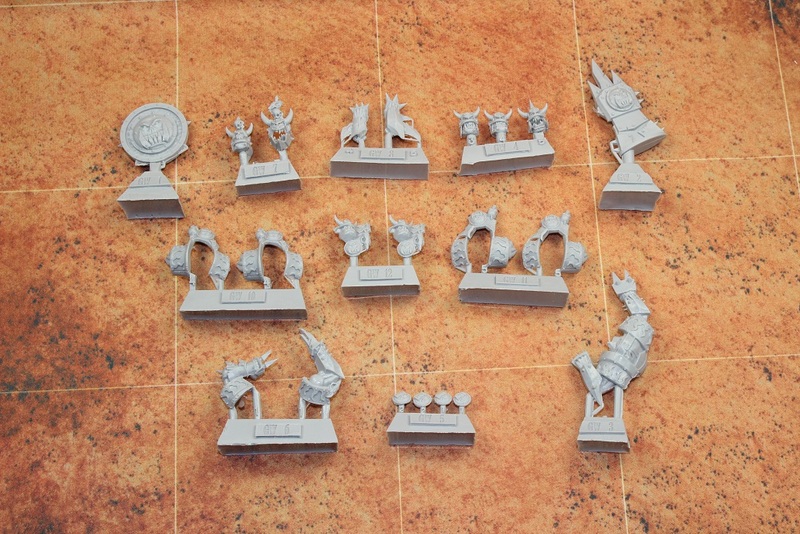 These are the exact same sprues that come in the Blood Bowl boxed set, as well as the Gouged Eye team box. Along with the players, the sprues contain two coin counters, two fist counters, and six different footballs. 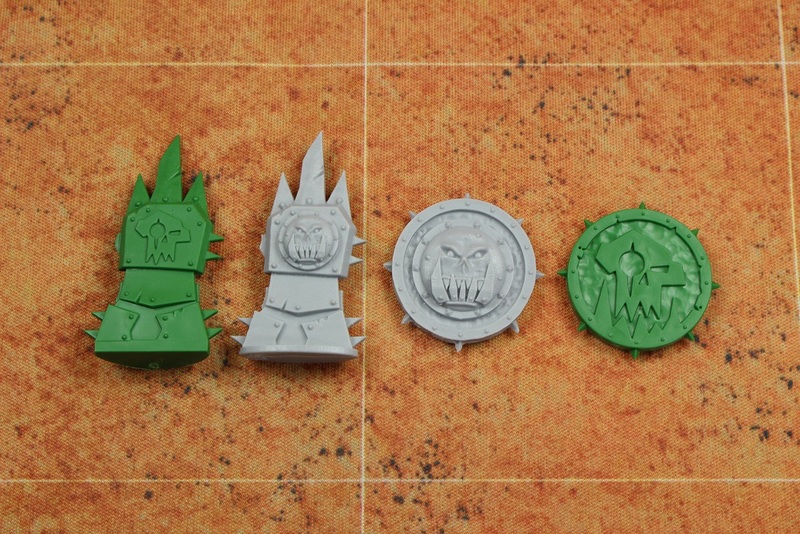 Like the Bright Crusaders box, the Orcland Raiders box also contains a plastic clam shell with twelves slotted bases, as well as the resin pieces to add the Raiders look to the existing minis. 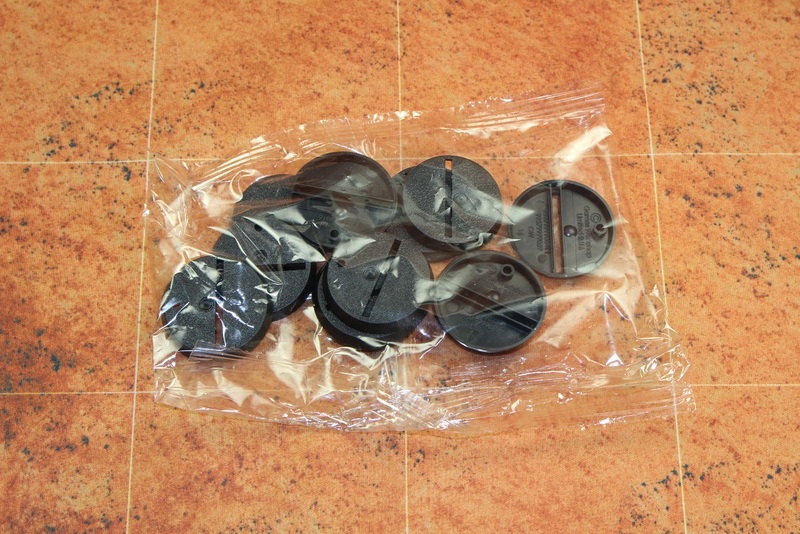 The bag of slotted bases. Here is a picture of one set of the resin pieces. 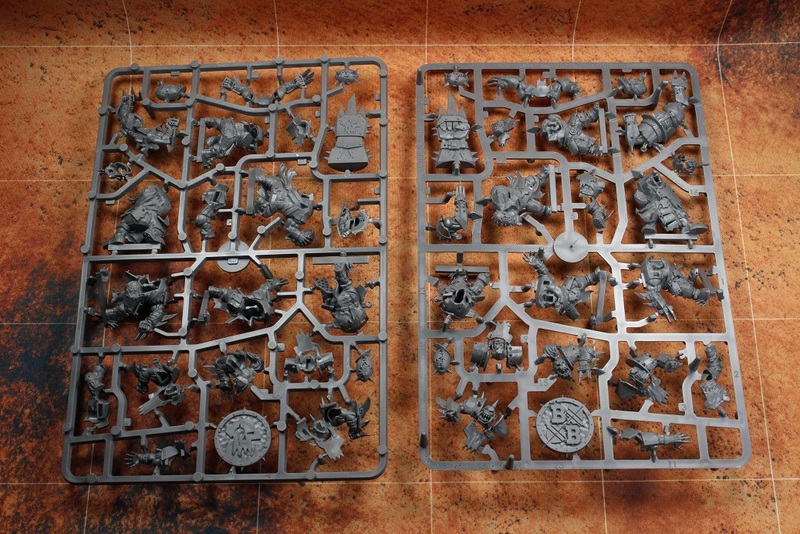 The Orcland Raiders box contains two sets of these pieces. Here are the Orcland Raiders counters next to the Gouged Eye counters. I am only showing one side because the flip side of both counters are the same. This is the only side of each counter that is different from the others. Next up are the players. I am not going to post pictures of each mini being built, because that would just be a LOT of pictures. Instead, I am posting pictures of each of the Orcland Raider minis next to their Gouged Eye counterparts. A group shot of each of the different sculpts. A group shot including the counters. So… at the end of the day, will the new Orcland Raiders replace my classic 3rd edition team? Nope. I think the minis are good, but even with the added versatility of the resin bits, there are still too many pieces that look the same as all the others to replace my old team with only a couple of repeated sculpts. The minis themselves are pretty decent. Some of the resin pieces were near flawless, while others had a few nasty mold lines. On top of that, the resin pieces did not always fit to the original plastic pieces as well as the Bright Crusaders pieces did. The fits were not exactly bad, but several of them will require a bit of green stuff to smooth out. In the end, I will probably do the same thing with these minis as I intend to do with the Crusaders set. Instead of using them to make a completely separate team, I will most likely use them to add a little more variation to a single Orc team. From a monetary standpoint, I really wish you could order JUST the resin pieces to add to the minis that came in the boxed set, but unfortunately that is just not an option. What do you think? Do you wish you could get the resin pieces separately? Do you plan on picking up the Orcland Raiders set too? 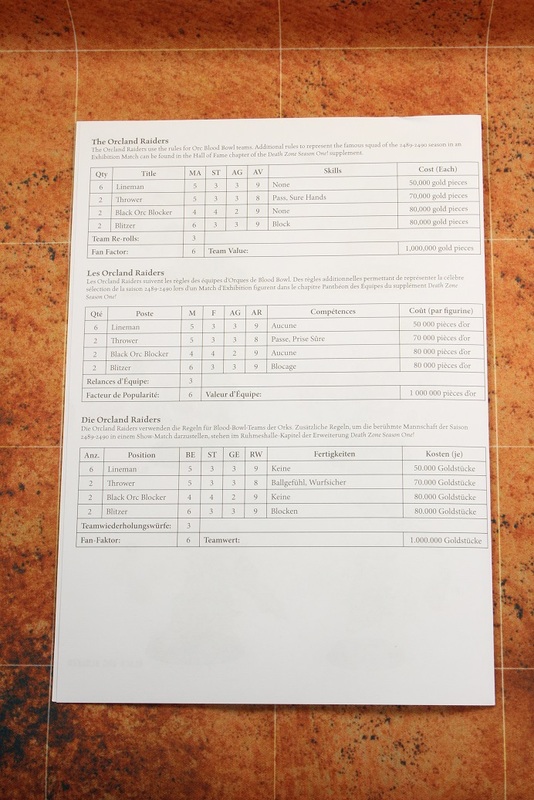 This entry was posted in Blood Bowl, Gaming and tagged Blood Bowl, Death Zone, Forge World, Forgeworld, Games Workshop, gaming, Miniatures, Orc Team, Orcland Raiders, Orcs, table-top games, tabletop wargames, wargames, Wargaming by Mike C. Bookmark the permalink. Love your ‘history of painting’ comment. I also started with cheap plastic brushes and testors model paints. I like to think I’ve made some progress in learning how to paint, but I also think I have a million years to go! I have the Human resin kit, but I haven’t cracked it open yet. Seeing your pics is pretty interesting. I didn’t realize that the sprue is the exact same (even the tokens), except a different color. I also agree, it would make more sense to sell the resin kits separately as add-ons. I also remembered another reason I’m waiting on the Orcland Raiders, and that’s because I have no idea if they are going to release additional positionals for the Orcs and what that means for these resin kits. They aren’t cheap, and if it means that I have to buy another upgrade, I don’t know. All of that said, I prefer the look of the Orcland Raiders over the Gouged Eye. They have less of those metal plate armor pieces, which I’m just not crazy about. I think if I got the Orcland Raiders, there’s a good chance that I would get rid of the Gouged Eye minis. Unless I really want two Orc teams. I will likely have 2 Human teams, so who knows. Well, the word is that a Gouged Eye booster pack should be coming eventually. I have not actually heard anything about a Orcland Raiders booster pack, though. I suppose it may happen eventually, but I would not hold my breath. I can understand why they sell the Raiders and the Bright Crusaders as full sets with the plastic pieces as well, but an option to only order the resin pieces would be nice for those of use that already have multiple sets of the Human and Orc teams. Do you happen to know what the contents of the Gouged Eye pack will be? Have not heard anything yet about specific contents. Just the repeated assurance from the Forge World team that they are coming eventually.